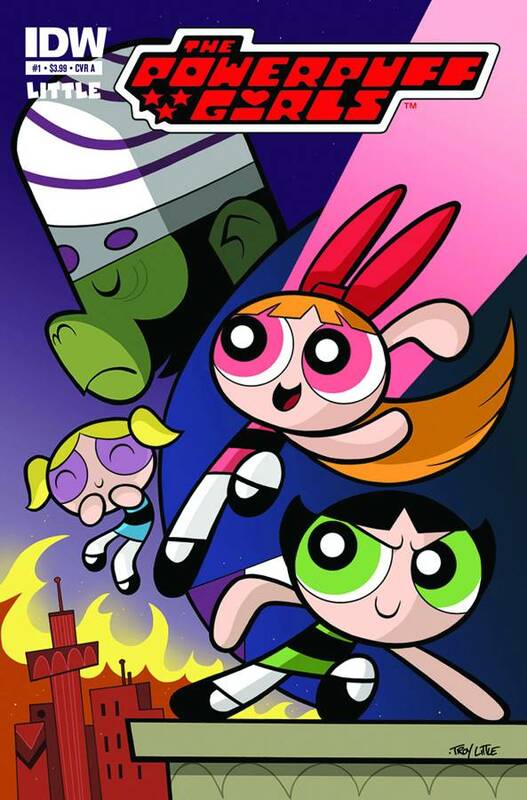 “It’s always the girls, never poor JoJo,” since season 1 of The Powerpuff Girls the villainous genius monkey known has Mojo JoJo has been living in the shadow of the superhero trio he inadvertently helped to create. 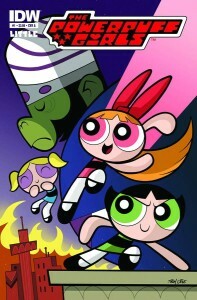 Now, in their first comic adventure, Blossom (“commander and the leader”), Bubbles (“she is the joy and the laughter”) and Buttercup (“she is the toughest fighter”) deal with everyday Mojo problems that result in what could be an A-typical result. Keeping the series in the original animation family, Troy Little takes the helm on both writing and artistic duties. The images stay true to the original cartoon. However, the static and slightly varying animated images on the show had the benefit of movie backgrounds that enhanced fight scenes and movement along with great sound effects. Unfortunately, that’s not something static panels in a print comic can convey as well. This is a series that would benefit greatly from a digital comic “Guided View” that used color and speech bubble placement to help provide more active transitions and action. Little does a great job of invoking Mojo Jojo’s monologue speech. However, for those who are not familiar with the series or the character’s voice, it could be hard to find humor or entertainment in the villain’s traditional inward reflection monologue. Also, the interactions with the three main female heroes seem stunted, considering how far their relationships had grown through the cartoon series. The girl’s basic, almost mean, and one-dimensional reactions to Mojo’s plans to take over do a good job of summarizing the basics of how each group feels about one another. The cliffhanger at the end will definitely keep well-informed plans around, but might confuse new readers who are not as familiar with Mojo’s origin story. One would only hope that the exposition of his origin will be quickly revisited in issue two for those just hopping aboard. The good news is that cultural references, which were abundant in the television series, continue in the comic. This time references are made to target comic book readers with a transitional villain taking the focus off Mojo. I will be getting issue two, because the potential for something greater and bigger sense of fun is down the road. For those just learning about The Powerpuff Girls, this issue might not be as straight forward and seem somewhat mundane for those not as familiar with the show’s formula.